When Eiichi Kunitomo's beloved Omotesando Koffee announced it was closing back in December 2015, fans went into veritable mourning, forming long queues outside the backstreet shop in the blistering cold, all desperate to savour one last cup. Even after Tokyo's favourite koffeeshop had shut its doors for good a little over a year ago, the ever-jovial Kunitomo continued his caffeine-fuelled activities further east at Toranomon Koffee and opened a Hong Kong outpost of his original joint in 2016, but there was still something missing. 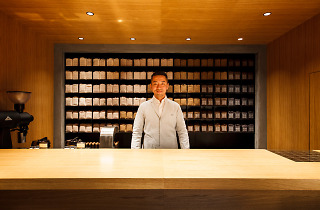 Now, he's quite literally gone back to where it all started with a bean-specialist shop named Koffee Mameya – set in the exact same location as the old Omotesando Koffee, albeit in a new building – opened on January 27. Mameya is set to sell between 15 and 20 varieties of beans, all in 150g bags, with prices ranging from ¥1,200 to ¥4,000. You'll be placing your order at the counter, telling the barista (either in English or Japanese) how you usually like to drink your coffee at home, and then have him or her help you pick out some beans. You can also let your beans be ground for a specific purpose or machine on the spot. And yes, they do still serve coffee to go as well, but the two-option menu is as simple as it gets: 'coffee' or espresso, take it or leave it. Kunitomo was particularly keen on telling us about the shop's contract roasters – five in total – which include Nagoya's Bontain Coffee, Ogawa Cafe in Kyoto, Fukuoka's Tokado Coffee and one each from Melbourne and Hong Kong. Inside each bean bag you'll find a card detailing some of the baristas' advice, including exactly how much coffee you should use for different brews. And if that still doesn't feel in-depth enough for you, know that Mameya also hosts weekday workshops from 6pm, right after the shop has closed for the day, giving you an opportunity to ask the staff everything you've ever wanted to know about joe. Kunitomo emphasises that he hopes 'our customers will be able to learn more not just about the origins of or who roasted their beans, but what the contrasts are between different varieties'. Judging by the massive popularity of his previous venture, we're sure the koffee king will be getting plenty of eager students soon.